Who wouldn’t want a royal wardrobe? The fashion choices of Meghan Markle (now the Duchess of Sussex) and Kate Middleton (aka, the Duchess of Cambridge) are recreated by thousands of people everyday. (It’s no wonder experts call their influence “the Duchess Effect.”) But Meghan’s and Kate’s followers aren’t the only ones known to recreate their looks. The duchesses themselves are known to outfit-repeat from time to time, and, yes, wear the exact same piece of clothing for more than one — or three — occasions. The British royal family is known as one of the most elusive groups in the world, but when it comes to what’s in their closet, the royals are pretty relatable. 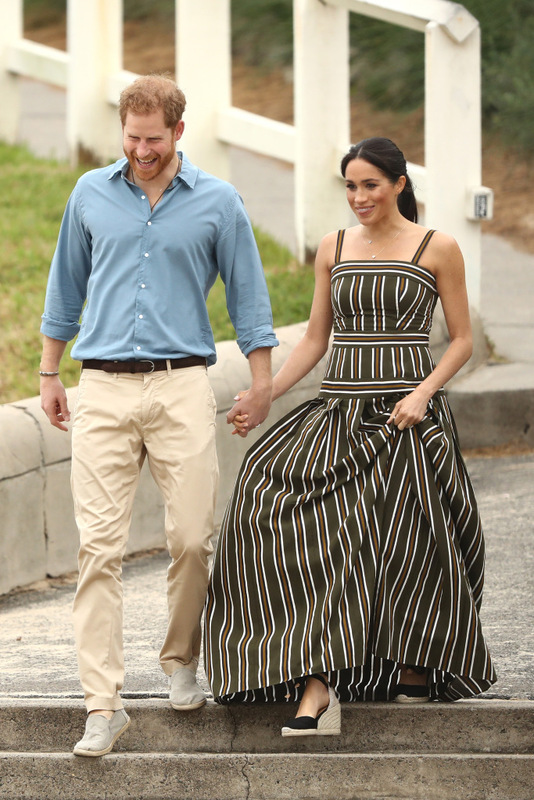 Like most of us, they’re known to hang onto their favorite clothes for years and re-wear them whenever they have the chance, and Meghan and Kate are no exception. 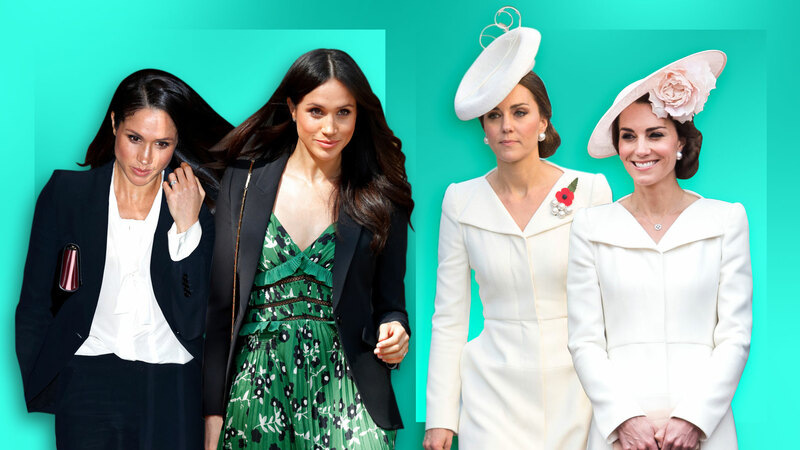 From royal engagements to red carpets, the Duchesses of Sussex and Cambridge have been seen re-wearing dresses, coats, shoes and more for years. But what are the duchess’s favorite pieces of clothing? We did the legwork to find the 15 clothing pieces Meghan and Kate have re-worn over and over. In a society that discourages celebrities from being photographed in the same clothing item twice (let alone four times), it’s refreshing to see Meghan’s and Kate’s moves toward a more sustainable fashion industry. Check out the clothes they love to re-wear ahead. Kate has been seen in this white Alexander McQueen coatdress on not one, but four occasions. The duchess was first seen in the dress in July 2015 when she wore it to daughter Princess Charlotte’s christening in King’s Lynn, England. Next, she wore it in July 2016 at Queen Elizabeth’s Trooping the Colour, a parade celebrating the queen’s birthday. She wore it again a year later in July 2017 at the Last Post Ceremony, a commemoration marking the centenary of the Passchendaele battle. Her most recent time wearing the coatdress was in May 2018 at the wedding of Prince Harry and Meghan. Image: Andrew Matthews/WPA Pool/Getty Images. In a break from royal tradition, Meghan wore these black Veronica Beard trousers at her second royal engagement with Prince Harry in London in January 2018. A month later in February 2018, the duchess wore the trousers again with a plaid coat and a cross-body bag (another tradition-breaking fashion item) at a visit to Edinburgh Castle in Scotland. Image: John Stillwell/WPA Pool/Getty Images. Meghan was first seen in this Stella McCartney cape dress in April 2018 at a concert in Royal Albert Hall to celebrate Queen Elizabeth’s 92nd birthday. She wore it again in October 2018 at the opening ceremony for the Invictus Games in Sydney, Australia. Image: Gareth Fuller/WPA Pool/Getty Images. Like Carrie Bradshaw, Meghan is also a fan of Manolo Blahniks. 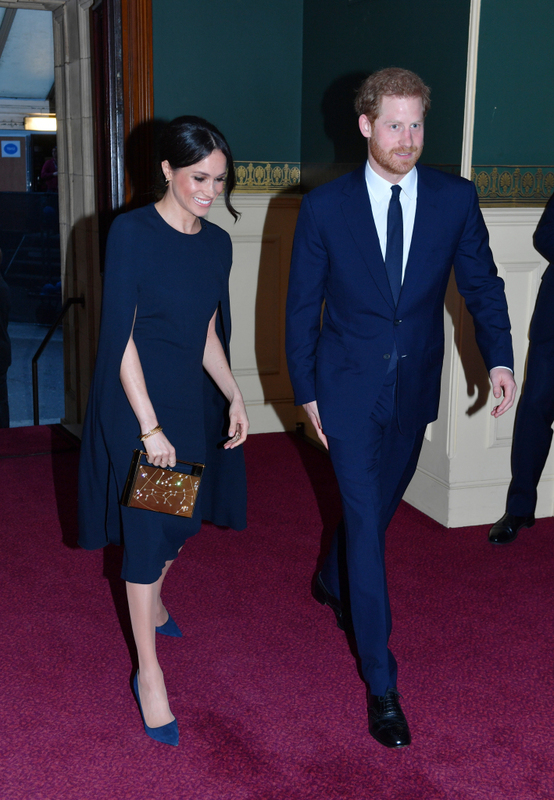 She first wore these dark-blue heels, which feature a tint of red on the sole, at Princess Eugenie’s wedding to Jack Brooksbank in October 2018. 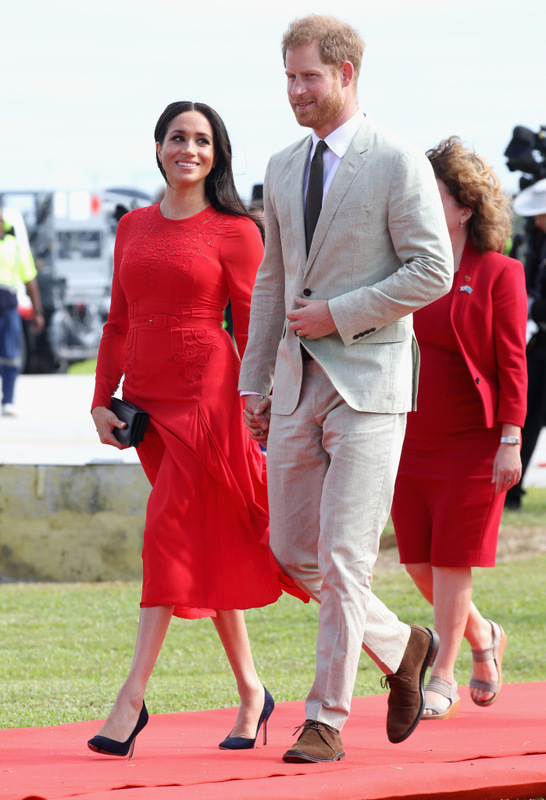 A couple of weeks later, in the same month, Meghan wore the heels again when she arrived at Fua’amotu Airport in Tonga as part of her 16-day royal tour with Prince Harry. It’s well-known Queen Elizabeth isn’t the biggest fan of wedges, but that hasn’t stopped Meghan from wearing them on two occasions. The duchess was first seen in these Castañer Carina espadrilles in October 2018 at Bondi Beach in Sydney, Australia, on her royal tour with Prince Harry. She wore them at another stop in Fiji in the same month on a visit to the University of South Pacific. Meghan made headlines in September when she closed her own car door at the opening of the “Oceania” exhibition at an art museum in London in September 2018. But the day was also the first time she wore these Aquazzura heels, which featured small bows on the ankle. She wore the heels again in October 2018 at a state dinner in Tonga with Prince Harry. The first time Meghan wore this Alexander McQueen blazer was at the Endeavour Fund Awards in February 2018. Though she wore it as part of a suit the first time, the duchess ditched her pants and used the blazer as a jacket over her dress at an Invictus Games reception in London moths later in April 2018. Kate is such a fan of this Temperley London lace gown she’s worn it on three occasions. The first time was at the United Kingdom premiere of War Horse in January 2012. The second was at a reception for the University of St Andrews in November 2012. And the third was at a screening at London’s Natural History Museum in December 2013. Image: Eddie Mulholland/WPA Pool/Getty Images. Image: Neil Mockford/Alex Huckle/GC Images/Getty Images. Kate has been seen in this light blue Seraphine coatdress twice. The first was at a visit to the Kensington Aldridge Academy in London in January 2015, and the second was at a visit to London’s Maurice Wohl Clinical Neuroscience Institute in January 2018. 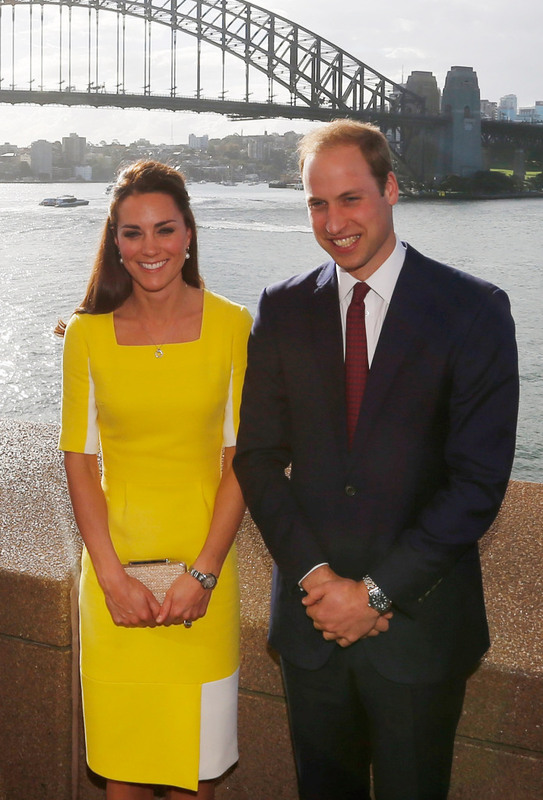 The first time Kate wore this yellow Roksanda Ilincic dress was at a reception at the Sydney Opera House in Australia with Prince William in April 2014. She wore it again two years later in July 2016 at the Wimbledon tennis championships in London. Image: Danny Lawson/WPA Pool/Getty Images. This red Luisa Spagnoli coatdress has been worn three times by Kate. The first was at a visit to the University of St Andrews, where she first met Prince William, in February 2011. Next, she wore it in April 2014 at a visit to the Christchurch City Council Building in New Zealand. She wore it a third time in February 2017 at an assembly for Children’s Mental Health Week in London. Kate has worn this black Jenny Packham gown twice. The first was in February 2014 at the Portrait Gala, and the second was later that year in December 2014 at the St Andrews 600th Anniversary Dinner. Kate was first seen kicking around a soccer ball in this plaid Hobbs dress in July 2012 at London’s Bacon’s College. She was seen in the dress again in April 2014 on a visit to Ayers Rock, Australia, with Prince William. Kate wore the same Emilia Wickstead coatdress for two St. Patrick’s Days in a row. The green coatdress (perfect for the holiday) first appeared in March 2012 as she walked in the Aldershot, England St. Patrick’s Day parade. She wore the coatdress again the following year in March 2013 for another St. Patrick’s Day parade in Aldershot. Kate has been seen twice in this black lace Diane von Furstenberg gown. The first was in November 2014 when she attended the Royal Variety Performance in London, and the second was in November 2017 when she attended a gala dinner for the Anna Freud National Center for Children and Families in Kensington Palace.